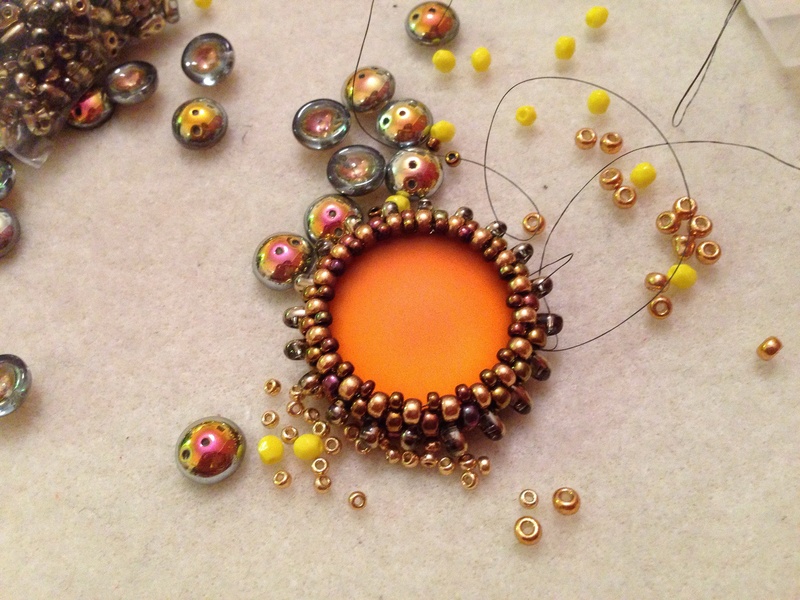 I know this blog is supposed to be about beadwork, but at the moment I also have the dressmaking bug. This year’s Great British Sewing Bee inspired me to lug out the machine for me, rather than curtains, cushions or children’s fancy dress. I bought a copy of the lovely Japanese book (Yoshiko Tskiori’s Stylish Dress Book) a while back and have made a couple of tunics already, which I’ll tell you about at some point, but I needed some fabric which I can’t source locally, and as I’ve not yet settled into ordering dress fabric online I popped up to Goldhawk Road for the first time ever this week to seek some out. Despite having been a Dress Fabrics and Haberdashery Department Manager in my early career I’ve never been to Goldhawk Road before – I used to visit Berwick Street regularly to check out the competition, but never ventured to west London. So I girded my sewist loins and boarded the tube for Shepherd’s Bush, trotted across the green and arrived in a strange fabric shoppers nivarna. In between the takeaways, Tesco Metros, betting shops and vape shops, for the 200 yards between the corner of Shepherd’s Bush Green and Goldhawk Road tube there are just fabric shops. That’s it. Each one different but the same – the same Aladdin’s caves of fabrics, spilling out onto the floor, rolls stacked every which way, but with a huge variety of fabrics in each individual shop. And no two ranges the same in any two shops – always different colours, textures, prices, qualities. Mind boggling. In the end I spent about 2 hours there, going from shop to shop, trying to remember what was where, and work out what I actually wanted to buy. Going with a plan of some kind would definitely have been a good idea – my vague ‘stuff for a tunic or dress but not summer fabrics’ was helpful, but as you will see from my purchases, hard to stick to – everyone else seemed to have something specific in mind. I missed out on a couple of fabrics because I clean forgot which shop they were in (I can still visualise the stack of rolls of Liberty cord, but couldn’t find the right shop when I had decided to buy), and found the whole experience slightly overwhelming, with rolls everywhere, patchy pricing meaning you had to actually talk to people (not my favourite thing in shops), and just the sheer variety on offer was extraordinary, and much better than expected. I loved it, got some fantastic bargains (and some marvellous not so bargains), and will be going back (but not until I’ve made up everything I bought – I do have some self control you know). Anyway, to give you some idea of the kind of things that are available, here are my somewhat random purchases. I’d love to tell you which shops they came from, but I really can’t be sure! Lovely rough woven silk, medium weight. Not on my list, but it spoke to me while I was buying the muslin, screaming ‘ask him how much I am, I am so lush’. £12 pm – this was intended for a winter weight tunic dress, but may be too nice (and probably dry clean only, I forgot to check), so may be a collarless coat instead when I get a bit better/more confident. Suiting weight polyester blend, this one will be a tunic dress for work. I’m thinking slightly A line (Stylish Dress Book F) but with fancy sleeves (SDB top B but without the wrist elastic so kind of bell shaped). £12 pm. Muslin in vivid magenta (what else) – very narrow, but only £2 pm so I bought lots! Tunic shirty thing – SDB G, J or W depending on how clever/stylish I feel. But not until the spring since this is definitely summer wearing stuff. Will be quite exciting to make a garment for under £10! Cheapo giant check gingham. I’ve wanted some of this for ages, it’s a bit stiff but hopefully will wash to soft. Probably a simple square tunic (would look nice as a SBD E but I don’t have the courage to try and sort out patterns and pleats with a cheap, probably slightly warped fabric). £2.50 pm! Lovely Italian viscose jersey – not the cheapest on offer, but definitely the best quality. This is going to be a SDB tunic Q, but longer. It may have to wait until I can get some fusible seam binding though as I am still a bit scared of knits and this will help. I wouldn’t want any bagging around my bust after all. £12pm. And then this was the really naughty one. The one that broke all the rules (price and season). But I don’t care because it is completely and utterly gorgeous, even the smallest snotty boy is fascinated by it. It’s a German digitally printed cotton voile (but quite a heavy one, just one step off a lawn really). It will need lining, and careful thought about use of pattern (the repeat is about a metre), and will be completely outrageous and totally, totally lush. A very brightly coloured, parrot like, Hiawathaesque delight. A dress I think, but only once I’m really, really competent! £20 pm. Oops. 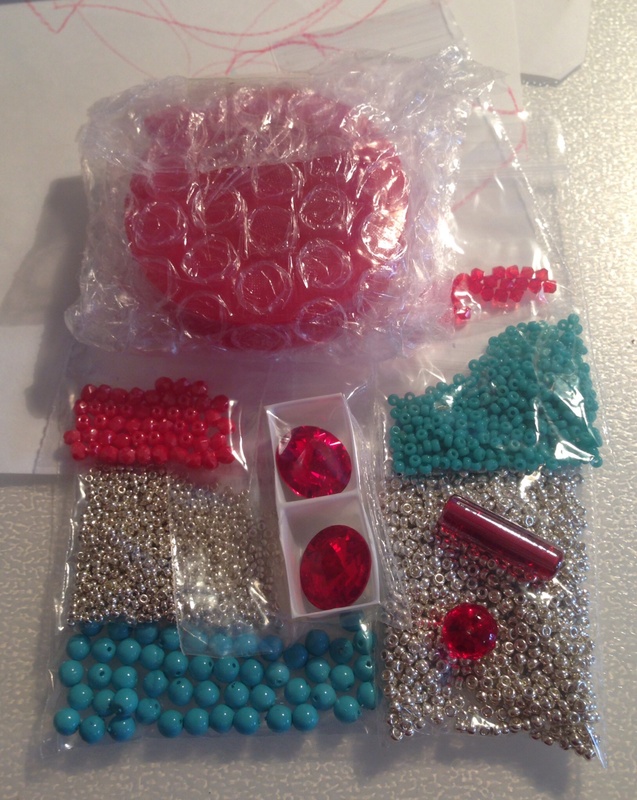 So there you have it – a fun, overwhelming afternoon adding to my dressmaking stash. And not a dinosaur costume in sight. To celebrate the temporary arrival of spring, and a really awesome family day out at Legoland, I’m offering 10% off everything in my Folksy and Etsy shops until Friday 1st April. Just stick the code SPRINGSPRUNG in the appropriate box at checkout, and you too can feel perky and enervated. 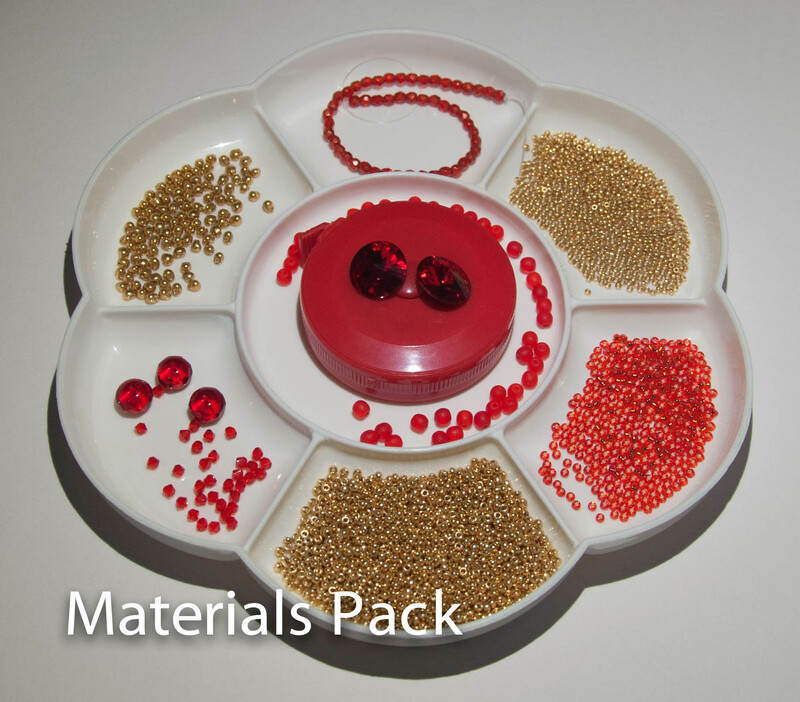 Also known as Beaded Bead 6, Great Balls of Spikes is now available as a tutorial, with materials packs coming soon hopefully. 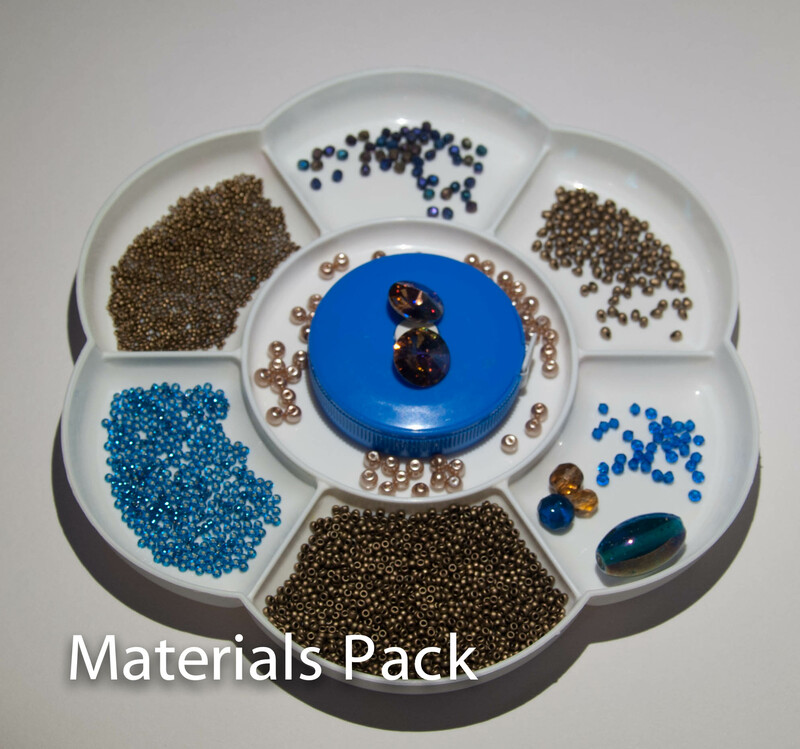 When I have time I will be putting together some materials packs, so let me know if you have any colour requests. It would be helpful if I could break out of my current neon pink and violet obsession………. Ok, so it probably won’t still be May 4th by the time I post this, and to be honest I’m not really a big Star Wars fan. I mean why does Yoda keep saying ‘you are wise young Jedi’ to Anekin – he’s clearly not even slightly wise, since he got his girlfriend pregnant and changed the fate of the universe – use contraception you twit? That said, DH is a fan, I do like the concept of Star Wars day, and I have this awesome Icos pendant by Jean Power to tell you about which reminds me of the Death Star. As usual it was a lovely design to work, there’s one tricky bit at the corners of the outer puffs, but once you’ve cracked that it goes together very nicely. I would really really love to do one with crystals – it will look fab and be even quicker, but for now I’m really pleased with this one. 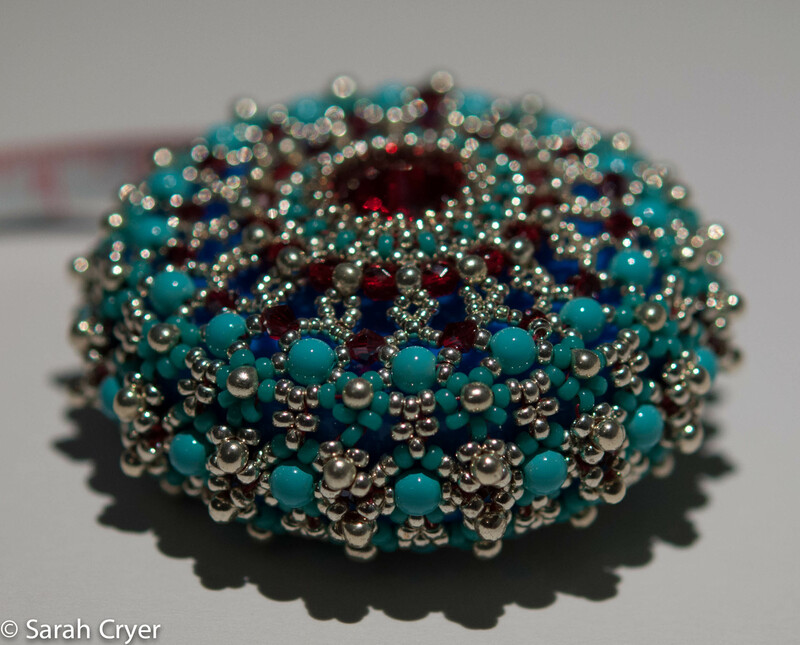 I don’t have anything to mount it from yet – I’m undecided as to whether to bead a loop. Jean uses a wire loop on what I assume is a headpin, but since I didn’t plan ahead and put it in before I zipped up the final seam I will need to either come up with an alternative or unpick a bit. I’m going to wear it with a purple tunic I live in at work during the winter, so I have a while to decide, now the weather has improved at last. If I had been more organised I would have used a cheaper finish delica for the inner rows of the base triangle (Jean does point out that these rows won’t be visible and labels them C1, but I was away and only had the three colours with me). Thanks to some help from my beady friends, my first foray into materials packs for my Baroque Tape Measure Surround Tutorial has gone well. So I’ve had a root around and have put together some more. As is inevitable with beadwork, I have had to order some beads, so not all of them are quite ready to go, but I thought I’d give you an idea of what is coming as well as the two more that are ready and listed, in case you see something you fancy. 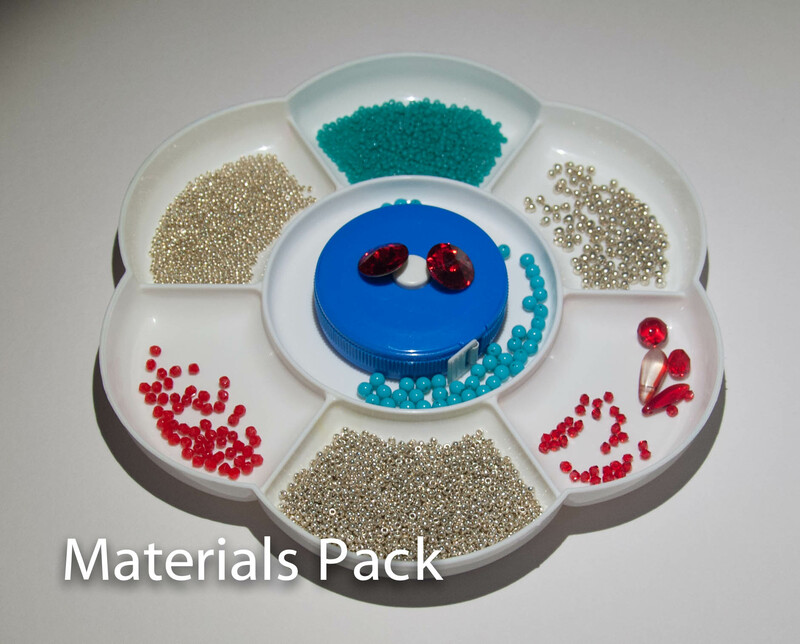 A slightly different red, silver and turquoise materials pack! 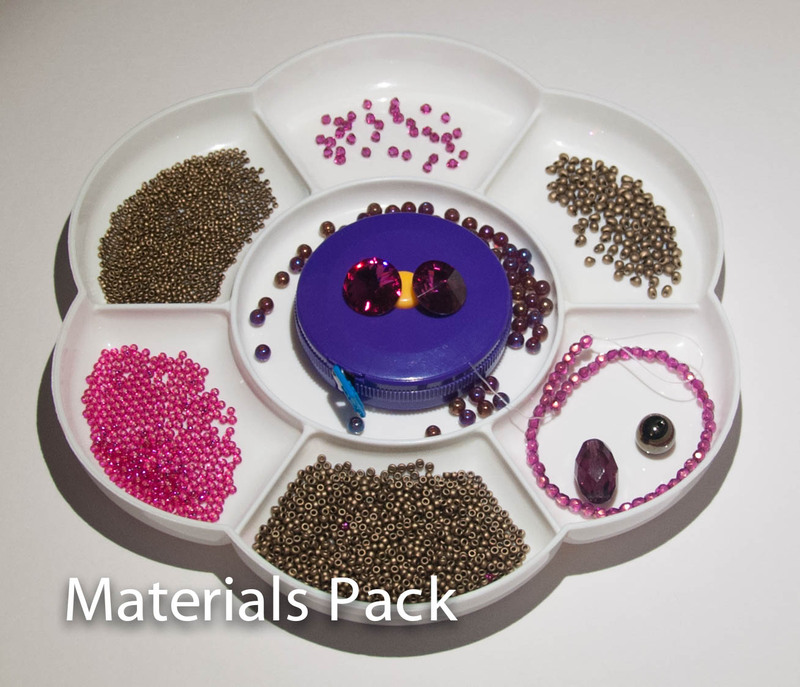 Gold Iris and Fuschia Materials Pack – waiting for bicones! 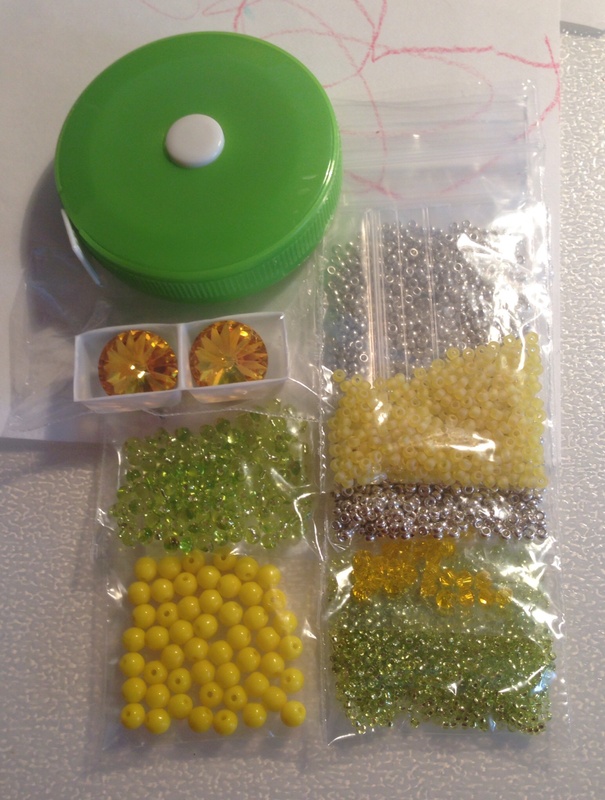 Lemon and Lime Materials Pack, waiting for bicones and firepolisheds! And finally, I hope to get a new tutorial up within the next couple of days – something a little simpler featuring a bit of oink! Here’s a teaser……. 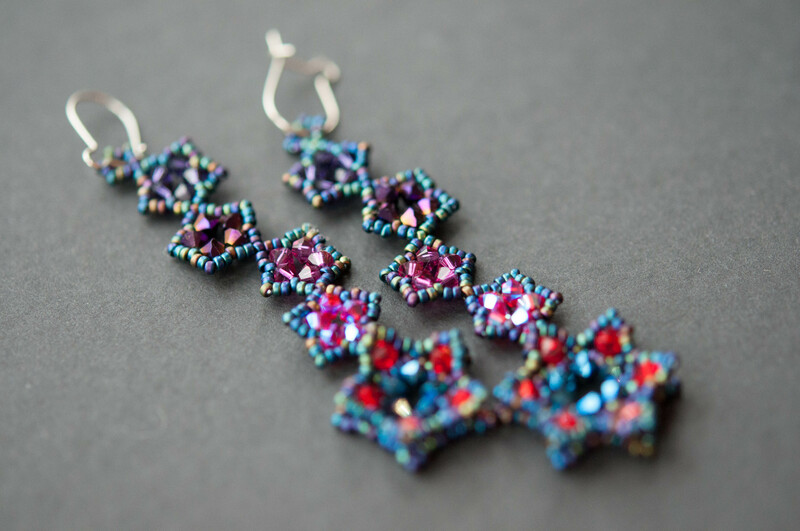 Before Christmas I beaded another project from Beadwork Evolution – ‘Stars We Are’ earrings. I wore them a couple of times (sadly dangly earrings don’t get worn much when there is a toddler in the house), but it was only when I laid them out to photograph them at the weekend that I realised I’d messed up! Have you spotted it? To give you a clue it’s my old problem with hexagons versus pentagons……. So I am pleased to report that this design can be adapted to form a five sided star at the base rather than six. Ideally though one should adapt both earrings, not just one! 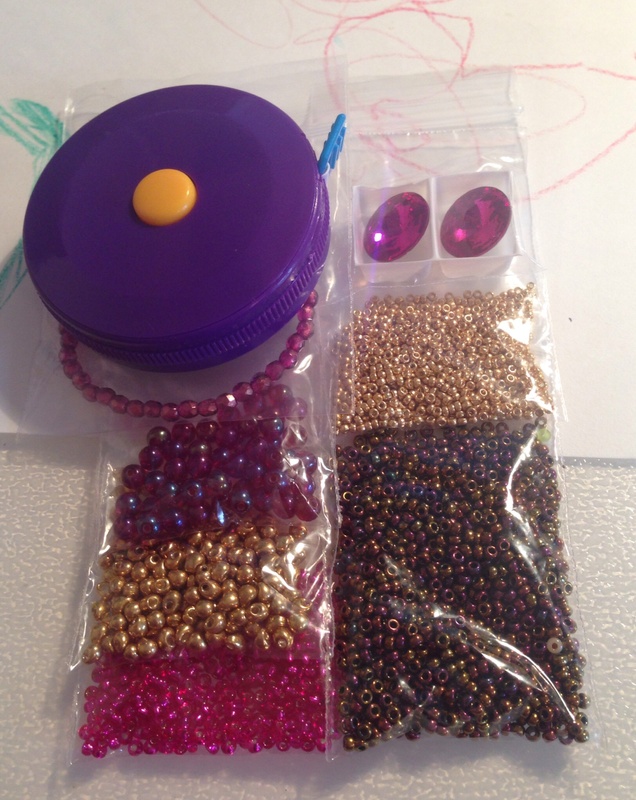 Sabine uses two colours of crystals. I couldn’t choose just two, so I used six and ran from red with a contrasting centre of metallic blue, through pink to purple. I like hers, and I like mine too. Pay attention – the way the stars are joined and constructed is very elegant in it’s simplicity, but it took a few repeats to get the hang of it as it is not obvious. 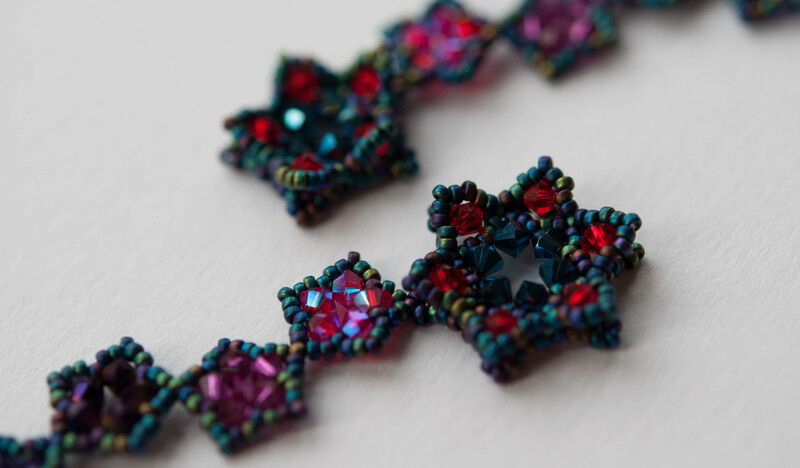 And clearly check how many repeats you have put in each unit……..
Really lovely, nice to make and fabulous to wear. It took under an hour per earring, probably less for a second go, so I’m definitely going to make again in some other colours. I’ve got some lovely opaque bicones which might make a less blingy version for the daytime as well. Just a quick post to let you all know that I’ve put together some materials packs for the Baroque Tape Measure Surround. Two colourways which I’ve beaded up previously, including the original Bronze & Fuchsia, plus two completely new colourways never yet made, so they will be completely unique. They are available here on Folksy (Bronze & Fuchsia; Bronze & Capri Blue; Silver, Red & Turquoise, Gold & Scarlet) and here on Etsy. For choice I’d love it if you used Folksy as they are very nice and I’m really, really upset with Etsy about their behaviour to sellers around the whole EU VAT thing…… more about that another day. Now I’ve got a good stock of tape measures and those elusive 2.8mm drops I’m more than happy to put together custom materials packs for you – just drop me a message/comment with a colourway request and I’ll have a beady play. Although these are listed for UK sales only, I’m happy to discuss and set up overseas postage – be aware that now I’m back at work I can’t get to the Post Office as easily for overseas posting (for UK posting I’ve carefully planned these as letter post size to avoid that trip), but if we have a chat I can let you know what to expect.